Jagmeet Singh said he is "deeply disturbed" by an ex-staffer's allegations. Peter Stoffer speaks during a news conference on Parliament Hill on Dec. 9, 2014. HALIFAX — Former New Democrat MP Peter Stoffer issued a series of public apologies Friday for behaviour he acknowledged was perceived as demeaning or inappropriate, saying he never intended to insult anyone or make them feel uncomfortable. 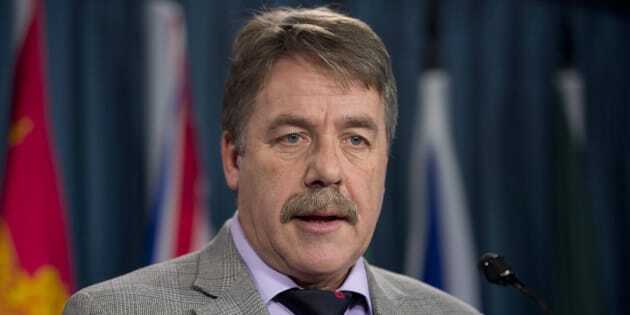 Stoffer's acknowledgment came a day after allegations of inappropriate touching and kissing were levelled against him by women who worked with him on Parliament Hill between 2006 and 2009. The popular former politician and well-known veterans advocate held a news conference in Halifax, where he said he was "deeply apologetic and regretful" for what happened when he was the member of Parliament for the suburban riding of Sackville-Preston-Chezzetcook. Stoffer, who served as a Nova Scotia MP from 1997 to 2015, specifically denied sexually assaulting or physically abusing anyone. However, he admitted that his actions as a "touchy" and "very gregarious, fun-going person" may have led to behaviour that was perceived as inappropriate. "By some of the comments that I've heard recently, from some people in the past, they're saying that some of my demeanour, some of my comments were inappropriate," he said. "For that I humbly apologize without reservation. If there is any man or any woman that at any time felt uncomfortable ... because of my demeanour in any way shape or form, for that I apologize and I humbly regret that I put them in that type of situation." In all, Stoffer apologized five times. In allegations made public Thursday, one of the complainants, Lauren Dobson-Hughes, accused him of grabbing and kissing her without her consent on two separate occasions in 2006 and 2009. Dobson-Hughes, who was an NDP staffer at the time, told the National Post that several MPs and senior staff were present at the second alleged incident "but nobody batted an eyelid." Stoffer said he has not been in contact with Dobson-Hughes, but he said he was willing to talk to her. Federal NDP Leader Jagmeet Singh said Thursday that he was "deeply disturbed" by the allegations, and he said the party would continue to "review, renew and expand" its harassment policies. Stoffer also apologized to the federal and provincial wings of the NDP, saying he regretted "besmirching their good reputation." He said he would not attend the party's upcoming convention in Ottawa. "The discussion we're having now across the country is extremely important," he said, apparently referring to the recent wave of allegations highlighting the inappropriate behaviour of men in positions of power. "All men and women deserve to work in a place where they feel comfortable and not harassed in any way shape or form." Stoffer, speaking to reporters gathered outside the Canadian Immigration Museum at Pier 21, said he did not intend to "insult or demean or belittle" anyone, but he said he has come to accept that's "exactly what happened." He said he grew up listening to the raunchy humour of Rodney Dangerfield and Canadian comedians MacLean and MacLean, a notorious musical duo known for their strong language and bawdy topics. As well, he mentioned his attempt to enliven the "dry and toxic environment" on Parliament Hill by organizing an annual "all-party party" for the 3,000 people who work in the parliamentary precinct. "Everybody knows that the office I had was, what I would call, a fun office," he said, adding that visitors were encouraged to play pool, shoot darts or "have a cold one."